With a pair of clippers in one hand and a camera resting on his hip, Jim Moffett surveys the land that makes up the Green Hills Preserve, a 168-acre Natural Lands Trust preserve in Mohnton, Pa. As he walks through the field and into the woods along a trail he helped create, he identifies plants and frequently pauses to snap a picture of a bird resting on a tree limb or telephone wire. Natural Lands Trust works to preserve land from development, and since it began land restoration work at Green Hills Preserve in 2012, Moffett has installed 14 bluebird boxes, and maintains about 70 species of native grasses and wildflowers. Moffett became interested in land preservation after he graduated in 2012 from Force of Nature, a six-month program that trains individuals in identifying invasive and native plants, wildlife, and trail maintenance. This spurred him to begin volunteering at several preserves, including Green Hills and Crows Nest Preserve in Elverson, Pa. “I wanted to see wildlife coexist and have its place in our society,” Moffett says. Moffett met Brian Delphus, a naturalist and part-time park ranger, in the Force of Nature program and they bonded through their passion for preserving nature. Their friendship continued after they graduated in 2012. Delphus was volunteering at Stroud Preserve in West Chester, Pa., at the time when they started to get together on the weekends to work on the preserves together. “It was clear that Jim’s passion was really about the individual resource, the plant species and how they interact,” Delphus says. A few months after graduating, Moffett asked Natural Lands Trust to start Second Sunday work days, which he and Delphus take turns hosting. A majority of the work is clipping invasive species from the land, which isn’t “glory work” but it makes a difference, Moffett says. “When you get there, he knows what we need to do and lays it out for us, then we can go out and just do it,” says Bob Cunningham, a Force of Nature graduate and Second Sunday work-day volunteer. 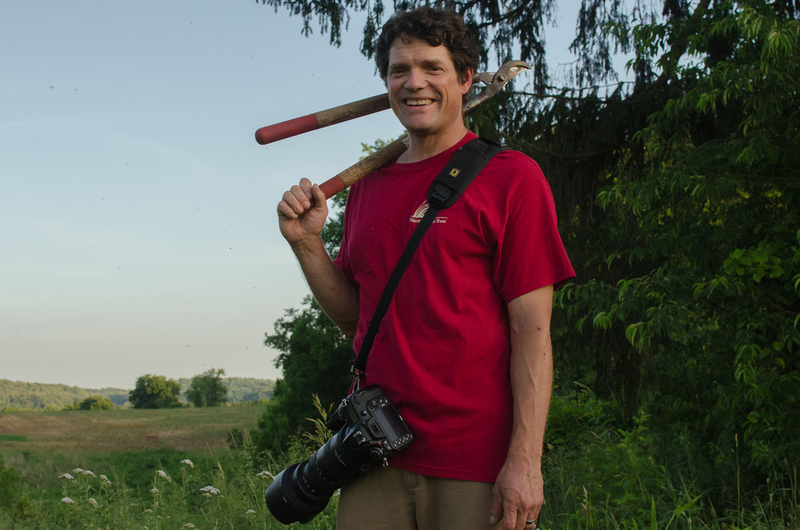 When Moffett isn’t clearing invasive species or maintaining trails, he’s snapping photos of birds and nature, which he often gives to Natural Lands Trust. “As my passion for nature grew, I knew I wanted to take better pictures of my experiences out in nature,” he says. “He doesn’t tell me about the places he went to, he tells me the birds he got pictures of,” Delphus says. In 2012, Moffett also enrolled in the Master Naturalist, an open, $170 55-hour program with a capstone, offered by The Land Conservancy of Southern Chester County. Moffett’s capstone for the program is creating and maintaining a wildflower meadow at the Bucktoe Creek Preserve in Kennett Square, Pa. In addition to the Second Sunday work days, Master Naturalist program, and his full-time construction job, Moffett maintains approximately 50 bluebird boxes at Struble Lake. And thanks to him, Green Hills Preserve is now on its way to becoming a blooming meadow with a walking trail designed as a two-mile series of nested loops. But he's not finished yet. “There is a lot more to do and I am looking forward to it,” Moffett says. Interested in enrolling in the Force of Nature program?